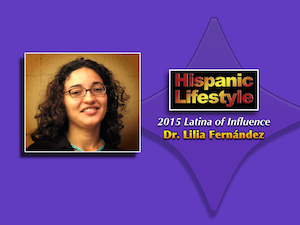 Dr. Lilia Fernández is a 2015 Latina of Influence named by Hispanic Lifestyle. Dr. Fernández is being recognized for her commitment to educating our community and her work as an author. Hispanic Lifestyle’s 2015 Latinas of Influence will be recognizing Dr. Fernández and her fellow Latinas of Influence during a luncheon held in their honor on at Latina Conference 2015. Born and raised in Chicago, Dr. Fernández was the first in her family to graduate from high school and attend college. She grew up in a working class family, the oldest of five children raised by a single mother. In her early years, Fernandez lived in the Mexican barrio of Pilsen in Chicago. She attended the local school until a teacher pointed out her extraordinary academic ability and recommended a magnet school for gifted and talented students. After several years there, however, another teacher suggested the Latin School of Chicago, one of the most prestigious private college preparatory schools in the city. Lilia easily passed the rigorous entrance exam and secured an academic scholarship to attend. She studied from 6th grade through high school and excelled academically. Upon graduation, Lilia went on to receive her bachelor’s degree from Harvard University. She graduated with honors as a Government major in only three years. After working for several years in college settings in Los Angeles and Chicago, Lilia pursued a master’s degree in Educational Policy Studies from the University of Illinois at Urbana-Champaign. She decided to continue her graduate education in Ethnic Studies at the University of California San Diego where she earned a second master’s degree in 2002 and a doctorate in 2005. Today, Dr. Fernandez is an associate professor in the History Department at The Ohio State University and is also affiliated with the Latino/a Studies Program, the Department of Women’s, Gender, and Sexuality Studies, and the Comparative Studies Department. She has taught at Ohio State since 2006 and earned tenure in 2012. She has also held an appointment as a Visiting Scholar at Northwestern University and as a Chancellor’s Postdoctoral Fellow at the University of Illinois at Urbana-Champaign. Fernandez’s research interests include U.S. Latino history, immigration, race and identity, urban renewal and gentrification, women’s history, urban education and many others. She has published over two dozen articles and essays, and has given nearly 100 presentations on her work throughout the United States and Puerto Rico, including at the 25th Annual Chicago Humanities Festival, the Latino Midwest Symposium, the COMPAS Conference on Immigration, the Beyond the Barrio Symposium, the Urban History Association and many more. She has also presented her work at universities such as DePaul, Texas A&M, Rutgers, University of Chicago, and Brown University among others. On her campus, Dr. Fernandez serves as a graduate advisor and undergraduate mentor, and has also served on nearly twenty committees and working groups such as the Latino/a Studies Advisory Committee, the Diversity Committee, the Faculty of Color Caucus and the University Senate. Her groundbreaking book Brown in the Windy City: Mexicans and Puerto Ricans in Postwar Chicago was released in 2012 and is the first history to examine the migration of these two ethnic groups to Chicago. In her work, she discusses the social and economic changes that took place in the urban north in the mid-20th century, such as declining industrial employment and massive urban renewal projects and how Mexicans and Puerto Ricans navigated these dynamics to claim their own geographic and racial space in the city. In January 2013 she was featured on WTTW’s Chicago Tonight nightly news program. In a little over a year, the hardcover edition of Brown in the Windy City sold out, leading to its release in paperback in July 2014. Dr. Fernandez is the recipient of a number of prestigious awards, including the Ford Foundation pre-doctoral, dissertation and postdoctoral fellowships as well as The Ohio State University’s 2011 Alumni Distinguished Teaching Award.